When the weather gets warm, nothing can spoil the mood like an insect infestation - especially roaches. If you’re searching for an effective way to get rid of them, you’re in the right place. We researched some of the best brands and top selling products to put together our roach spray reviews to help you find the right spray for you. Before we get to our top picks, let’s look at some of the key things you should know about before you start shopping. Odorless: Some of these are odorless and others have other smells that have been added, like florals or mint or even lemon. None of our top picks have a lingering chemical smell that will hang around after treatment. Pieces: We found a few products that come in multipacks of 2 or more. If you live in an area where infestations are consistently a problem, getting a multipack is one way to get a lot of product for a bulk price. 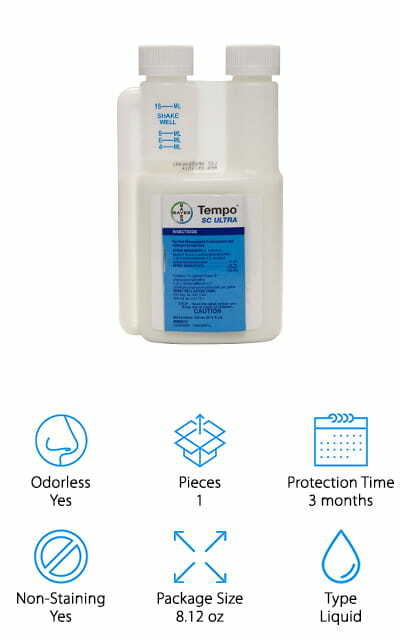 Protection Time: Typically, this is how long the product continues to be effective on a dry, non-porous surface. If you use them outdoors or in a damp area, you may need to apply the spray again early. Non-Staining: This is important, especially if you’re going to use it indoors. The last thing you want is to ruin your wood floors, curtains, or carpets because you’re trying to get the bugs out of your house. Package Size: This is an important thing to know. One thing to keep in mind is that at least one of our top picks is diluted and needs to be mixed with water. So, this number isn’t always straightforward. Type: All of these are applied by spraying. Some of them are liquid that needs to be added to water and put in a spray bottle or a spray foam that expands when it hits the surface. Now that you know the key things to look for, let’s move along into our roach spray buying guide. If you’re in a hurry, check out our top and budget picks first. They’re right at the top of our list and will give you a good idea about the range that’s available. Stick around if you can, each of these products is unique in its own way. Now, let’s take a look at the best bug spray for roaches. Our top pick is the best roach killer spray we found in our research, Tempo Ultra SC Pest Control. This is an 8 ounce bottle that makes about 30 gallons of spray once diluted appropriately. In other words, it will last you a really long time. It’s powerful stuff. In fact, it’s just as powerful as some of the concentrated, powdered insecticides used to kill roaches only in a much easier to use liquid form. On average, this spray protects for about 3 months but will need to be reapplied depending on the environment. If you live in a rainy environment, you might need to reapply every few weeks. This bug spray can be used indoors and outdoors. Plus, it’s odor-free and non-staining, one less thing to worry about. Our budget pick is a great choice if you’re looking for the best cheap roach spray. 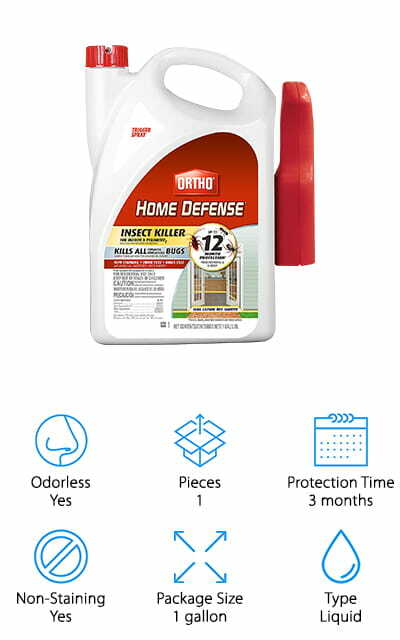 Ortho Home Defense Max provides up to 12 months of protection against roaches on nonporous surfaces. It works with ants, spiders, and over 130 other insects, too. Basically, if you have a large infestation or are constantly dealing with some kind of creepy crawly, this is a perfect bug spray to keep them all at bay. It’s a non-staining, odor-free formula that dries quickly. This 1 gallon trigger spray comes ready to use, too. No mixing required. This indoor/outdoor formula can be applied wherever you have a roach problem. You can use it anywhere, from around your baseboards and window trim to the perimeter of your deck or patio for long lasting pest control. 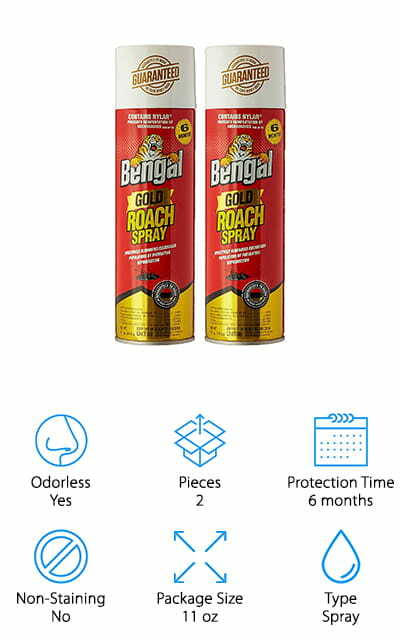 One of the reasons we’re calling Bengal Chemical Inc Roach Spray the best home bug spray for roaches is because it’s so convenient to use. You get 2 spray cans, each with 11 ounces of insecticide. It’s really easy to use, just aim and spray. It doesn’t have any odor and there’s no mess to worry about. You might be wondering how there’s no mess if this is a spray. Get this: it’s a dry spray. It can get deep into crevices and even get into the spaces where roaches live. It works by interfering with cockroach reproduction and can prevent re-infestations for up to 6 months. This is a strong product that’s one of the few sprays you can get that’s comparable to professional grade products. And with 2 cans, it will last a long time. 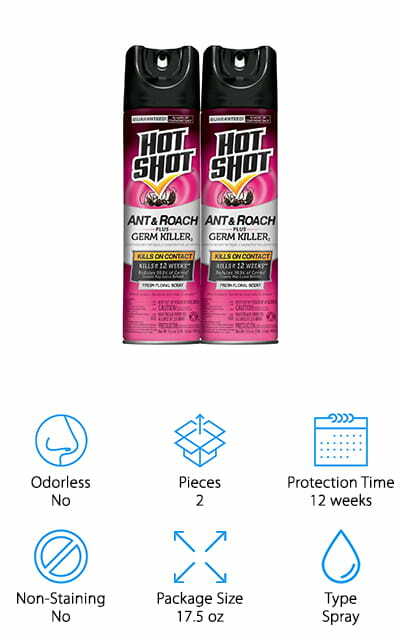 Hot Shot Ant and Roach Killer is some of the best roach spray for home if you’re looking for an effective DIY pest control product. This formula is water based and has a pleasant floral scent but don’t assume that makes it ineffective! It actually works really fast on roaches and is also really effective on a lot of other bugs, too. This is another good one if you get frequent infestations from a lot of different things. It can work for up to 12 weeks on non-porous surfaces. And get this: it even reduces up to 99.9% of the germs that the bugs leave behind. This is a 2 pack and the cans of spray are really big, too, at 17.5 oz. In other words, it should last a long time. One of the best things about our next pick for the best spray to get rid of roaches is that is registered with the EPA and has been approved for use in homes with people and pets. 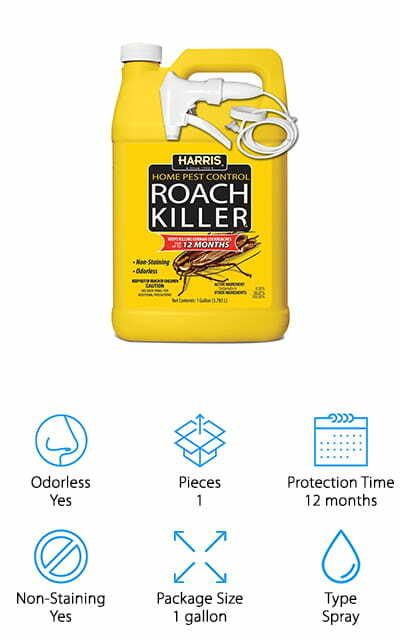 So, if you’ve been hesitating to use a roach spray because you’re worried about the effects on your family or pets, give Harris Roach Killer a try. This formula is odorless and non-staining and won’t damage fabrics when used as directed. That’s not all, you get a whole gallon of it and it works for 12 months on non-porous surfaces. That’s a lot of time and a lot of spray, this will last you awhile. It also comes with an extended trigger sprayer to help you get into those tight cracks and crevices and kill the bugs where they live. Another option is Combat Max Roach Killer. What’s special about this one is that it’s actually a spray foam. Why does that matter? How it works is it comes out of the bottle as a liquid and expands into a foam. This makes it really easy to get into hard to reach places because the foam penetrates even deeper once inside. It actually gets even deeper than liquid sprays which is one of the reasons that it’s so effective. It can get deep into the places where bugs go to hide. That’s not all, this spray goes on white so you can see where you’ve sprayed and dries invisible. 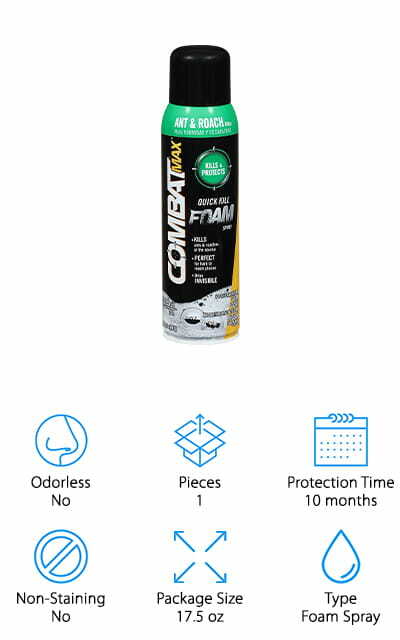 It has two key ingredients, one kills bugs right away and the other keeps working for up to 10 months on non-porous surfaces. 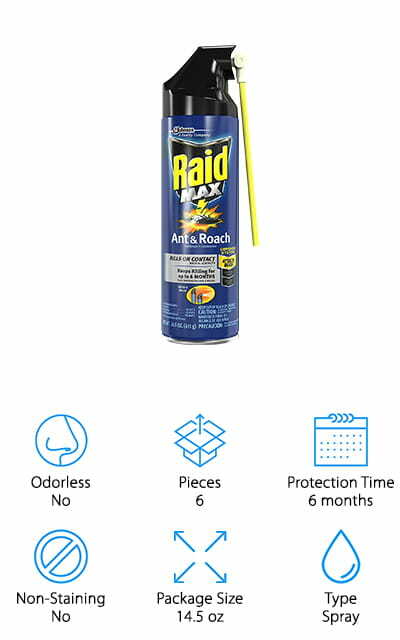 First of all, this Raid Max Roach Spray comes in a 6 pack of 14.5 ounce bottles. When you take into consideration that this formula gives you a protection time of up to 6 months, you can see how much coverage you’re really getting. This kills roaches as well as ants, crickets, spiders, and even waterbugs so this is a good pick if you deal with a lot of insects, too. Something special about this spray bottle is that it gives you 2 options for spray. First, it has a long applicator want that not only extends the reach of the spray, it also concentrates it so you can really get into cracks and crevices. Plus, you can remove the long applicator if you want to cover a wider area. 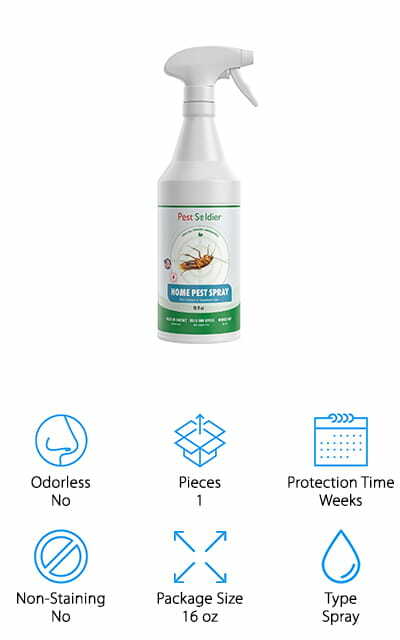 This spray from Pest Soldier is the first organic spray in our reviews. It’s made of all natural, organic, and non-toxic ingredients. If you’re worried about using a bug spray because you have young children or pets in your home, give this product a try. It promises to give you the same results without any of the harsh chemicals. It’s fast acting and keeps working for weeks at a time. This 16 ounce bottle has a fresh peppermint scent and can be used both indoors and outdoors. That’s not all. You might not think that a natural and organic product can be as effective as other formulas and they know people might be skeptical. So, Pest Soldier gives you 60 days to try it out. That’s right, it comes with a 60 day money back guarantee. 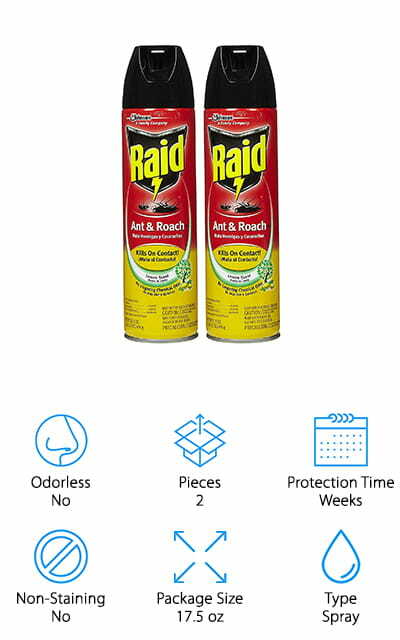 Next up is Raid Ant & Roach Spray. Raid is a well-known brand when it comes to pest control. In fact, this isn’t even their first appearance on our list. This is actually a 2-pack of sprays. Each is 17.5 ounces so you’re really getting a lot of treatment. This formula kills on contact and has a residual action of up to 4 weeks. So, these 2 bottles should last you a really long time, even if you have pretty regular infestations. Spray it onto surfaces where roaches or other pests are infesting. It’s effective in small cracks and surfaces, too. This product has a fresh lemon scent when you spray it but it doesn't have any lingering chemical odors after use. For a well-known and effective best roach spray for sale, this is a great option. 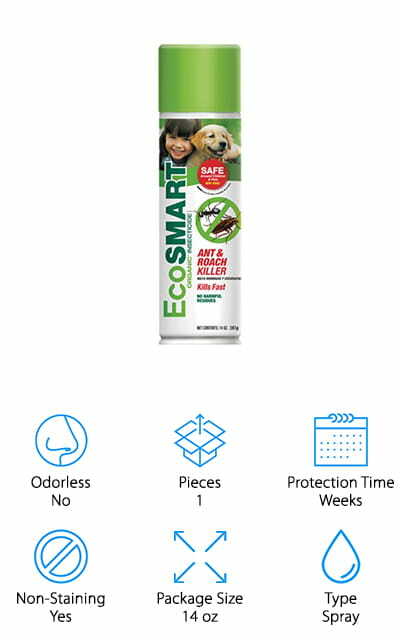 Last on our list of best bug spray for roaches is EcoSMART Organic Roach Killer. This is a 100% organic formula that’s non-toxic and safe for use around children and pets. This is a great option to use both inside and outside. Why? Because it won’t contaminate groundwater and is safe for birds and fish, too. You might be wondering what’s in it. Well, it includes natural plant oils like rosemary and cinnamon oil and uses the natural defenses of plants as the basis for the formula. It’s basically taking essential oils to another level by applying modern science. And it works. Not only does it kill on contact, it also has effects that last up to few weeks at a time. This formula has a strong, minty smell and won’t stain surfaces or fabrics.